Elena was born and raised in Greece and arrived in Canada in 2012. She has done extensive studies and work in Greece in the Mental Health area involving adults and children, who also often had other psychosocial problems such as physical abuse, toxic substance abuse and immigrants/ refugees suffering from post traumatic stress syndrome. She was involved in training public servants to deal effectively with clients who had special needs, so they are not treated unfairly or stigmatized. 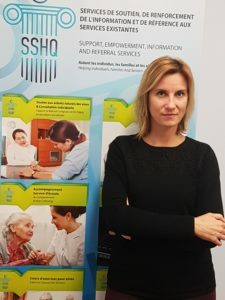 She was a member of the Mental health deinstitutionalization committee created by the Minister of health, in Greece entitled, «Monitoring and Support Group for the European Programme PSYCHARGOS» Which was the start to a process that led thousands of institutionalized people to live as autonomously and harmoniously as possible within the community. Being an immigrant herself, enables her to understand and defend against prejudices involving race, ethnic and language. She approaches her clients with respect, providing a personalized intervention plan to each, while assuring confidentiality.